Giving your cat treats can be a good way to encourage a particular behaviour, get a sick cat to eat, or just a well deserve tasty snack. However, there are many unhealthy cat snacks on the market that are filled with fillers and substance that are not beneficially to your cat's health. Cat treats should be chosen with the same precautions that we used to choose our cat's daily food. When deciding on which snacks to buy for your cat, carefully read the label and choose one where the ingredients start with two to three specific protein, instead of grains, corn, or meat by products. Even though your cat will just be eating these as a treat, it's always important to buy premium high quality food products for your cat. To find out more about the importance of choosing high premium dry food read How to choose the healthiest dry cat food. Treats that have added vitamins, mineral and taurine are great, your cat's snacks should provide additional vitamins and nutrients to your cat's diet. Cat snacks that are both tasty and do a job at the same time are also great. We're a big fan of dental and hairball treats, they help to remove the excess tartar from your cat's teeth or help to prevent hairballs all meanwhile your cat is enjoying their snack. It is importnt to also look for snacks that are lower in calories, 2-3 calories per snack is good, because treats can sometimes be an easy way for cats to put on some extra pounds. It's best to buy your cat snacks from the local pet food store, the grocery store usually only has the snacks that are filled with fillers, and unhealthy for your cat. Treats come in many different flavours and types. Fish flakes,which literally look like flakes of fish, can be easily sprinkled over wet food, if you're trying to entice your cat into a wet food diet, or serve as is. Pawbreakers are catnip rolled into a hard balls, kind of like a jawbreaker candy. There are also treats that have a hard outside and a soft meaty inside, some cats love those type. We love freeze dried treats, which are quite healthy, they are just simply frozen protein that come in several different flavours, beef and fish, just to name a few. 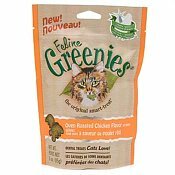 There are also cat treats that are hard exactly like dry food, feline greenies is a favourite in our home, they are high protein treats that helps to remove tartar from your cats teeth at the same time, and we're all about multitasking. Where Can I Get Healthy Cat Treats? We're also a fan of homemade treats, a piece of seasoned free salmon here, a piece of seasoned free chicken there; our carnivore cats just love it. Here are some of our easy to make homemade cat food recipes. How Often Should My Cat Get a Treat? Cat treats can be a nice way to reward your cat, whether your teaching him/her a new trick or just pleased that they used the scratching post instead of your sofa. Treats can be a used to praise and communicate to your cat that they've done a good job. At the same time treats should never replace the daily affection you show your cat, such as a nice petting session or play session. Cat snacks should be given in small amounts in moderation. We have been guilty ourselves in occasionally giving a few too many treats, all cat owners probably are. Sometimes when our cats are finished eating their treats, they rub between your legs or look up at you begging for more with their eyes and you can't help but give them a couple more snacks. However, snacks in addition to our cat's regular food can add extra calories and overtime extra weight. Overweight cats are more likely to become diabetic and have joint problems. To find out more about feline obesity and how to prevent it read Feline Obesity: Causes And Prevention.